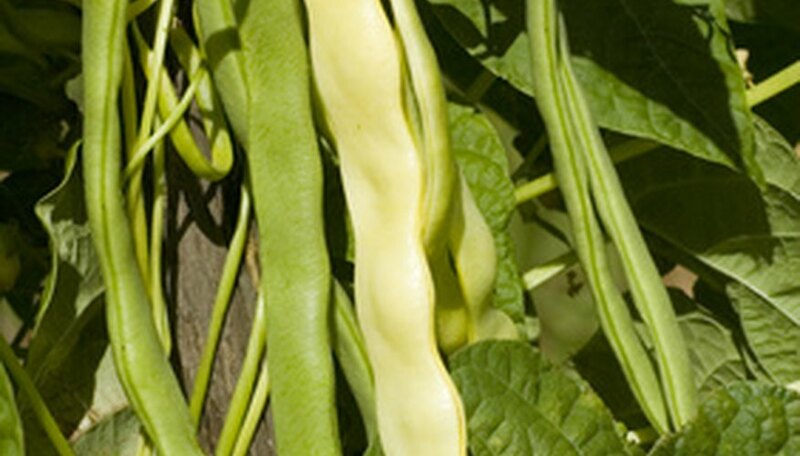 When your gardening space is limited, grow pole beans instead of bush beans. Because pole beans grow vertically up a tall support structure, you will use less gardening space yet harvest as much as three times more beans than you would from the same number of bush beans growing in rows in a garden. Keep a watchful eye on pole beans as they mature and harvest time approaches to ensure you pick the beans before they become tough. Watch the beans as they form on the plants. When the beans are approximately the same diameter as a pencil but you cannot yet detect the individual beans inside the pods, the beans are ready for harvest. If you wait until you can clearly see the beans bulging from the pods, the beans will be tough. Pick the beans from the bean plants with your hands, snapping them off cleanly at the point where the stems connect with the bean pods. Place the beans directly into the bucket or basket. Pick the beans again between three and five days later. As long as you keep picking the beans, you encourage the plants to continue producing more beans. You may succeed in harvesting beans as many as 10 times from the same plants as long as you perform regular picking at the recommended interval. Harvest pole beans from the bean plants while the plants are dry. Picking beans from wet plants may introduce bacteria to the plants that can damage them.